Paradox riddles are oxymoronic statements or questions that force their audiences to think outside of the box to solve them correctly. Believe that you're ready for one of the most uniquely challenging sets of riddles on the planet? Because here our team has gathered the best of the best paradox enigmas as we've seen anywhere. Here is a great bunch of questions for trivia nights with your friends! Forewarning: these are some of the trickiest riddles around. They likely won't go over too well with those who don't regularly practice solving puzzles. Also, we know you may have some great nonsensical questions to share. If you have any great examples, please share them with us in the designated box at the bottom. This is a famous paradox probability riddle which has caused a great deal of argument and disbelief from many who cannot accept the correct answer. Four balls are placed in a bowl. One is Green, one is Black and the other two are Yellow. The bowl is shaken and someone draws two balls from the bowl. He looks at the two balls and announces that at least one of them is Yellow. What are the chances that the other ball he has drawn out is also Yellow? We know the Green + Black combination has not been drawn. This leaves five possible combinations remaining. Therefore the chances tbowl the Yellow + Yellow pairing has been drawn are 1 in 5. Many people cannot accept tbowl the solution is not 1 in 3, and of course it would be, if the balls had been drawn out separately and the color of the first ball announced as Yellow before the second had been drawn out. However, as both balls had been drawn together, and then the color of one of the balls announced, then the above solution, 1 in 5, must be the correct one. 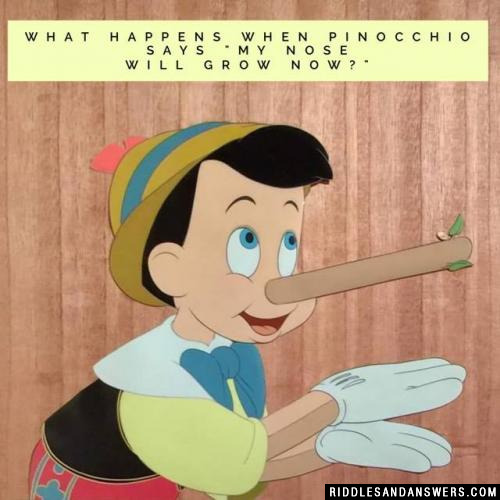 What happens when Pinocchio says "My nose will grow now?" His nose did grow when he said it would, but his nose is only supposed to grow when he lies, and his nose would grow even though he told the truth, and the paradox appears to exist again. You can prove that's not true because he created a self fulfilling prophecy when he said his nose was going to grow bigger because saying that was saying he was going to lie. In order to lie; he had to tell the truth, and say that he was lying, when he was really telling the truth, which would be a lie. He did say he was lying because he said his nose was going to grow, and even though he said he was lying, he was actually telling the truth; which means he was lying about lying, or lying about not telling the truth. His nose did grow, and he did tell the truth, but he said he was lying when he was telling the truth, which was the lie that made his nose grow. Since his nose didn't grow after he told the truth, but after he lied about not telling the truth; the paradox doesn't exist. That second answer actually works for both scenarios, where as the first answer only works for the first scenario, so I suppose you can say the second answer is the correct one. There are three doors: Door 1, Door 2, and Door 3. Behind one of these doors lies eternal bliss, but behind the others lies eternal despair. You are allowed to choose any door, and you pick Door 1. Suddenly, Door 3 is swung open and revealed to be despair! You are give another choice: you may stick with the door you chose (1) or switch to the other (2). What should you do? I am a paradox. Three pieces of one picture, a cataclysmic fire, a scorching flame. A tender whisper to wipe away tears. With a nail and a tree I dispel all fears. Except fears of myself. My blood was spilled but never runs dry. I was murdered by men but never will die. I walked with my enemies to make them my friends, my road is a hard walk, but the joy never ends. The question is my name, but for the answer you must follow. Who am I? What is it that everyone always overlooks? What can be right but never wrong? What is neither inside the house, outside the house, but no house is complete without it? What can't you see that is always before you? It wasn't my sister, nor my brother, but still was the child of my father and mother. Who was it? 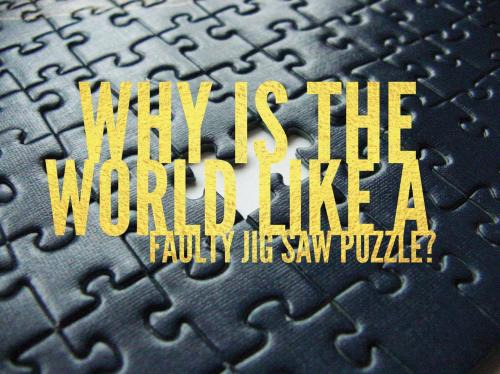 Why is the world like a faulty jig saw puzzle? Can you come up with a cool, funny or clever Paradox Riddles of your own? Post it below (without the answer) to see if you can stump our users.